Bunker Hill (CV-17) was launched 7 December 1942 by Bethlehem Steel Co., Quincy, Mass. ; sponsored by Mrs. Donald Boynton; and commissioned 24 May 1943, Captain J. J. Ballentine in command. Reporting to the Pacific in the fall of 1943 Bunker Hill participated in carrier operations during the Rabaul strike (11 November 1943) ; Gilbert Islands operation, including support of the landings on Tarawa (13 November-8 December) ; the Kavieng strikes in support of the Bismarck Archipelago operation (25 December 1943, 1 and 4 January 1944) ; Marshall Islands operation (29 January-8 February) ; strikes against Truk (17-18 February), during which eight Japanese combatant vessels were sunk; Marinas raid (23 February) ; Palau-Yap-Ulithi-Woleai raids (30 March-1 April) ; Truk-Satawan-Ponape raids (29 April-1 May) ; Hollandia operation (21-28 April) ; and Marianas operation (12 June-10 August), including the Battle of the Philippine Sea. On 19 June 1944, during the opening phases of the battle, Bunker Hill was damaged when an enemy near miss scattered shrapnel fragments across the ship. Two men were killed and over 80 were wounded. Bunker Hill continued to do battle and her planes aided in sinking one Japanese carrier and destroying a part of the 476 Japanese aircraft that were downed. During September she participated in the Western Caroline Islands operation and then launched strikes at Okinawa, Luzon, and Formosa until November. On 6 November Bunker Hill retired from the forward area and steamed to Bremerton, Wash., for a period of yard availability. Repairs completed, she departed the west coast 24 January 1945 and returned to the war front. During the remaining months of World War II Bunker Hill participated in the Iwo Jima operation and the 5th Fleet raids against Honshu and the Nansei Shoto (15 February 4 March) ; and the 5th and 3rd Fleet raids in support of the Okinawa operation. On 7 April 1945 Bunker Hill's planes took part in a fast carrier task force attack on a Japanese naval force in the East China Sea. The enemy battleship Yamato, one cruiser, and four destroyers were sunk. On the morning of 11 May 1945, while supporting the Okinawa invasion, Bunker Hill was hit and severely damaged by two suicide planes. Gasoline fires flamed up and several explosions took place. The ship suffered the loss of 346 men killed, 43 missing, and 264 wounded. Although badly crippled she managed to return to Bremerton via Pearl Harbor. In September Bunker Hill reported for duty with the "Magic Carpet" fleet. She remained on this duty as a unit of TG 16.12 returning veterans from the Pacific until January 1946 when she was ordered to Bremerton for inactivation. She was placed out of commission in reserve there 9 January 1947. While laid up, she was reclassified three times, becoming CVA-17 in October 1952, CVS-17 in August 1953 and AVT-9 in May 1959, the latter designation indicating that any future commissioned duty would be as an aircraft transport. 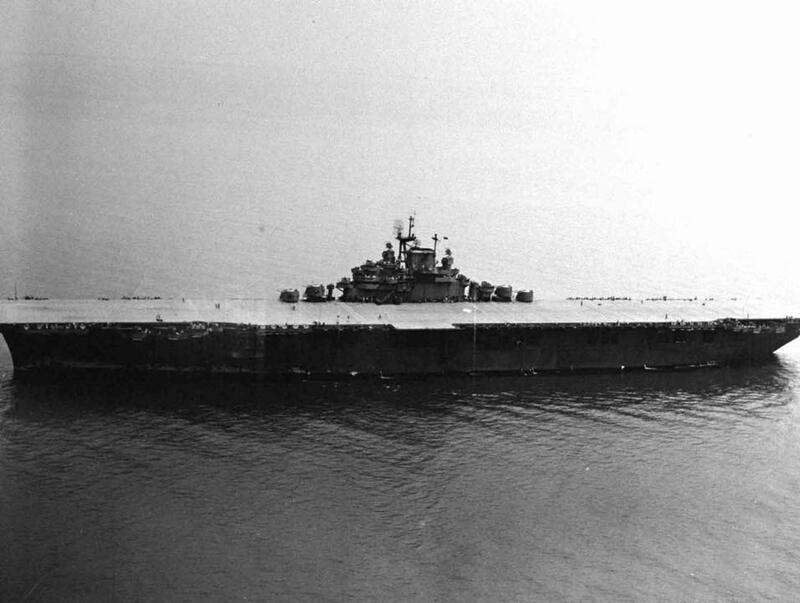 However, she was one of the two Essex-class carriers that saw no Cold War active service. Stricken from the Naval Vessel Register in November 1966, Bunker Hill was used as a stationary electronics test platform at San Diego during the 1960s and early 1970s. She was sold for scrapping in May 1973. Bunker Hill received the Presidential Unit Citation for the period 11 November 1943 to 11 May 1945. In addition, she received 11 battle stars for her World War II service.